Dollars into Sense: Make saving fun! Everyone knows that putting away money for a rainy day, no matter what the economic climate maybe, is never an easy thing to do. Factoring in one of the worst recessions most have us have seen in our lifetimes makes the very idea of having 3 months of living expenses set aside next to impossible. But for those who managed to stay employed since the debacle of 2008 have a new outlook when it comes to saving. Actually, when the recession first started fear and uncertainty were driving forces for people to actually spend less and save more. In fact from the end of 2008 through 2011 Americans were socking away more into their savings accounts and reducing credit card debt than they have in years prior. So what’s the best way to keep this trend going? Try making a game out of it. One of my New Year’s resolutions for 2012 was to run more often. I made a promise to myself that I would try to run at least 15 miles a week for the entire year just to see how consistent I can be. I started the goal in January and made it to February with relative ease. I was easily hitting my average and in some weeks even surpassing it depending on the weather. That is when I decided to up the ante a bit, by setting aside $2 for every mile I ran per week into a “running jar” that would be used to help pay for either a new pair of running shoes, marathons and other running events or a vacation at year end. Once I started doing this, I looked forward to my runs more and it made me more accountable as well, to not only to stay dedicated to my running regimen but it actually made me excited to put away that $30 or more a week. Making it actually fun to save. 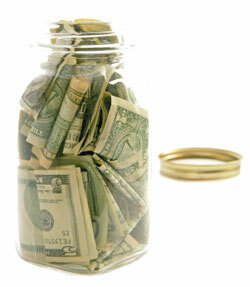 The more I ran the more money I would have in my jar. Anytime I would feel lazy or unmotivated to run, I would just look at my jar as a carrot dangling in front of me. I saw it as a possibility to pay for a marathon in a place that I have never been to. I actually enjoyed having to go to the ATM machine to feed my running jar. Another example would be, if you are trying to lose weight... why not put away $1 for every pound you lose per week? It’s not only a great way to put some cash away for something fun to do once you hit that magic number of lb's lost, it also motivates you to stay on track and be consistent with your diet and weight loss routine. We all know that once we graduate from young adults to just plain adults that most of the tactics our parents used to get us to do things when we were younger such as giving us an allowance just for taking out the trash, or pretending that a spoon full of green beans was an airplane flying into our mouths in order to get us to eat our vegetables are no longer. But that doesn’t mean that we can't employ our own interesting twist that makes something as monotonous and mundane as putting money away more fun.